An evening recalling Anthony Trollope’s years in Banagher will be held on Thursday 11th June in The Crank House, Banagher at 8p.m. Local Trollopian enthusiasts and historians will recall the writer’s life, give details of his improved lifestyle in Ireland and recount events he would have witnessed while in Banagher. 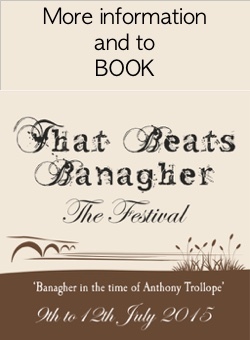 Details of a weekend festival to be held in Banagher from 9th to 12th July coming will also be announced. Refreshments will be served and everybody is welcome. Anthony Trollope was born just over 200 years ago on the 24th April 1815. Major commemorative events are being held throughout this year to celebrate his success as a renowned author and also to recall his career in the British Postal Service. After a hesitant start Trollope became a very prolific writer, publishing forty-seven novels, collections of short stories and several travel books. His most celebrated works include the Palliser and Barsetshire series, famous for their portrait of the ecclesiastical, political and landed classes in Victorian England. Trollope’s postal career began in 1834 when he was appointed junior clerk in the General Post Office in London. His work was rather humdrum and over the following seven years he was frequently in bother with his superiors. In August 1841when he learned of a vacancy for a surveyor’s clerk in the west of Ireland he immediately applied for the position and was readily accepted. Within a matter of weeks he arrived in Banagher to work with James Drought, the Surveyor for the West of Ireland. Over the next few years the quality of his life greatly improved. His income was much increased by the addition of travel and living allowances. Mr. Drought kept a pack of hounds and within a short time Trollope had bought a hunter and became a regular participant in the local fox hunt. Trollope’s time in Banagher coincided with the building of the present bridge. Like some of the engineers involved in the construction work Trollope joined the local masonic lodge. He was a regular attender at meetings and was elevated to the degree of Royal Arch Mason before his departure in 1844. During these years Trollope also became engaged and married to Rose Heseltine from Rotheram whom he met in Kingstown, (Dún Laoghaire). There was a new purpose to his endeavours at work where his duty was to inspect and not be inspected. Most important of all he began to write. His first novel, ‘The Macdermotts of Ballycloran’, was inspired by a working visit to Drumsna, County Leitrim in September 1843. This event is hosted by Banagher Development Group, and supported by Offaly Local Development Company, Offaly County Council and Fáilte Ireland. This entry was posted in Event on June 3, 2015 by Aileen Duffy.